Scot Moga is an experienced lawyer and counselor at law successfully representing clients in estate planning, wills, trusts and probate administration. Over 20 years in Upland. Serving all cities throughout the Inland Empire. InlandEmpireLawyers.com is the most comprehensive directory of local listings for estate planning attorneys in San Bernardino and Riverside. Our profiles have nearly every piece of information you'd want to research regarding local wills & trust lawyers including links to ratings and reviews from credible websites. No other law firms in the Inland Empire have the knowledge and experience relating to estate planning, business succession, probate, asset protection and trust administration as our lawyers and paralegal staff. We are truly the Inland Empire’s premier estate planning, elder and tax law firm. Banks, Garcia & Janis is a Rancho Cucamonga estate planning law firm which provides services in wills, living trusts, probate, business and real estate throughout the Inland Empire. Robert Firth is an Inland Empire estate planning lawyer focusing on modifying or drafting new wills, living trusts and advanced health care directives. Offices in Redlands, Cathedral City and El Centro and serving all cities in the San Bernardino and Riverside Counties. Put expertise on your side: Terrence Moynihan is a Certified specialist in Estate Planning. Maureen is the President of the Southern California Chapter of the National Academy of Elder Law Attorneys (NAELA) and President of the Riverside Estate Planning Council. Serving Riverside County as an estate planning attorney for wills, trusts and special needs. Estate planning lawyer in San Bernardino County for wills, trusts and special needs. Elder law, Medi-Care & Veteran's Affairs attorney in Palm Springs. Estate Planning Law is 1 of the 11 eligible areas of specialty in the state of California. Not every Estate Planning attorney is a "certified specialist" nor are they required to be. 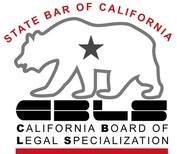 Attorneys who are "certified specialists" will be indicated with the logo, (below), directly on their profile. What does it take to become a California certified Estate Planning Law specialist? Click HERE.